In FileThis, tags help indicate the contents of documents. You can have an unlimited number of tags, assign multiple tags to any given document, and search based on tags. In the physical world, you might think of tags as the folders within a filing cabinet—that is, if a hard-copy document could exist in more than one folder at a time. Tags are the second-level of organization after cabinets. For example, you might place a receipt for a new faucet in your Home cabinet, and then apply tags such as Receipts and Home Repair. Untagged cabinet: FileThis may not be able to determine the content of documents that have imprecise file names and no text; you will need to tag those documents yourself. Viewing tags: It may take a few moments for FileThis to determine the content of a document and tag it. To see the results, you will need to refresh FileThis by performing some type of action (change cabinets, perform a search, change views). Then, click the Recently Added cabinet and select a document to see which tags are applied to it. 1. Click the Edit button in the Tags area; a field displays at the bottom of the Tags area. 2. Enter a name for the tag in the field and press Return/Enter or click New. The field remains active so you can create additional tags. 3. When you’re finished creating tags, click the Edit button again to exit the edit mode. 1. Use the search tools to display the documents you want to apply tags to. 3. Drag the documents to a tag name; release the mouse button when the green plus sign displays. The box next to the tag name is checked. 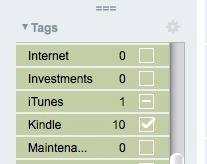 Tip: You can also simply click the box next to the tag name to apply it to the selected documents. 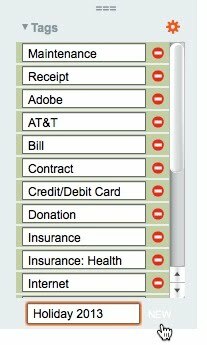 A blank box indicates that none of the selected documents have that tag. 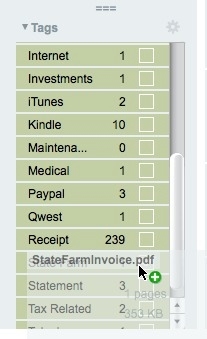 A checked box indicates that all the selected documents have that tag. A hyphen in a box indicates that one or more of the selected documents have that tag. Tip: The number next to the tag name shows how many documents that meet the current search criteria have that tag applied. To assign all the selected documents to a cabinet, click the box until a checkmark displays. To remove all the selected documents from a cabinet, click the box until it is blank. To edit a tag name, click the Edit button in the Tags area. Click in the field containing the tag name, type a new name, and press Return/Enter. Click the Edit button again to exit the edit mode. The tag remains applied to the same documents. 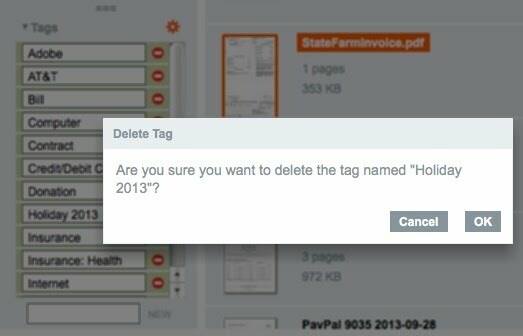 To delete a tag, click the Edit button. Click the red button next to the cabinet name, then click OK to confirm the deletion. Click the Edit button again to exit the edit mode. The documents remain in FileThis and other tags may be assigned to them. If not, you can always view the documents by clicking the Untagged cabinet.